World of Warcraft's environment design just keeps getting better and better. World of Warcraft: Battle for Azeroth is out in less than a month. To prepare for the inevitable madness of reviewing it, I'm dipping my toes into the beta to spend extra time with all of its exciting new features. And so far, despite a contrived overarching plot of all-out war between the Alliance and Horde, there's a lot to like about Battle for Azeroth. But of all those things, I never expected to fall so madly in love with Zandalar, one of its new zones. Unlike most expansions, Battle for Azeroth is really driving home the divide between Alliance and Horde by giving them each a separate continent containing three zones to explore and level up on. Once they reach the new level cap of 120, the opposing continent will become available to explore—albeit from the perspective of an invader rather than someone who is trying to help its denizens. It's a novel approach and one that, I hope, is going to pay off in a cool way. I haven't yet had a chance to see what the Alliance's continent of Kul Tiras looks like in person because, for the beta, I opted to play a Horde character and head to the primordial jungles of Zandalar. And damn, I'm so glad I did. Zandalar makes a stunning first impression. A quick note: I'm using the hidden 'actioncam' setting to get this over-the-shoulder camera angle seen in these screenshots. When you arrive in the capital city of Zuldazar by boat, it really drives home just how creative Blizzard has gotten with its world design. When the expansion was first announced, I wasn't all that excited by the idea of visiting the ancient troll empire of Zandalar. Warcraft's trolls just never really interested me. But this first vista immediately changed my mind. For the last little while World of Warcraft has been stuck in a rut by exploring the same themes and spaces over and over again. 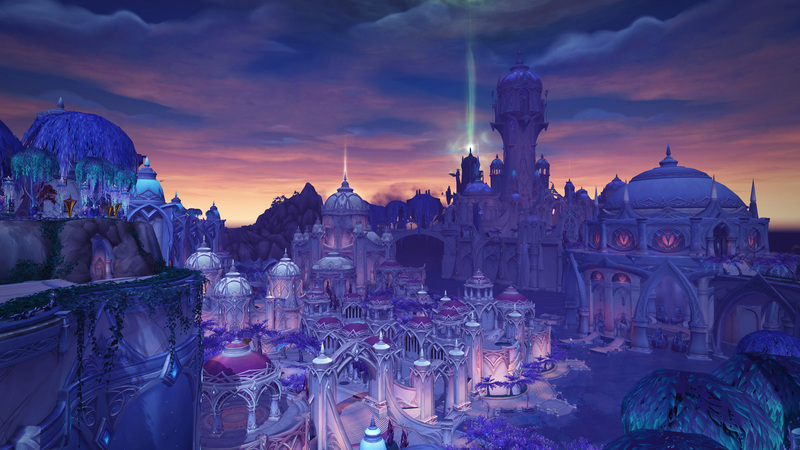 Warlords of Draenor and Legion both looked really good—especially the Nighborne city of Suramar—but these were aesthetics that we have seen time and time again. It is classic Warcraft, and, honestly, I'm a bit sick of demons, orcs, and elves. Zuldazar, by comparison, immediately strikes a chord with its golden towers tempered by lush green jungles. It's a huge city and I really enjoyed taking an hour or two to crawl through its side streets and back alleys just exploring. There's a ton of detail here, like raptor babies that scamper through the streets and a massive pterodactyl named Sky Queen that patrols the city. It really gives me a powerful sense of how untamed and wild Zandalar is. Similar to Legion, Battle for Azeroth has level-scaling so you can always choose where to quest and when. In Zandalar, after being introduced to the new main characters of the story, I was given three choices of where to quest: the swamps of Nazmir, the deserts of Vol'dun, or Zuldazar itself. I chose Nazmir because the idea of fighting cannibalistic blood troll invaders seemed exciting. But again, the most exciting part ended up being the world itself. When I first arrived at this vista, I had to stop and soak it all in—something I haven't done in World of Warcraft in a long time. It was this moment where I realized just how far WoW has come in terms of its environment design. Here was a foggy and detailed jungle sprawling into the distance where, if you step back into the old world of Azeroth, you see areas more like this. World of Warcraft really shows its age with zones like Dustwallow Marsh. The terrain is flat and soft, the skybox is horrific, and the foliage looks really two-dimensional and flat. Nazmir, by contrast, almost feels like an entirely different game. The jungles are really fun to explore, and Blizzard has done a great job of making this area feel atmospheric and immersive. I'm still doing the same old quests I've always done in Warcraft (albeit with more variety and story woven in), but they don't feel like a drag when the land itself is so enchanting. Battle for Azeroth makes some subtle improvements to World of Warcraft's graphics engine. During a recent interview for our upcoming cover story (keep an eye out for it on store shelves in the coming weeks), I was told that the lighting system had received a small upgrade. When I ventured deep enough into Nazmir to find Uldir, the Heart of Darkness, those improvements were obvious. It's a suitably ominous scene considering Uldir is the setting for Battle for Azeroth's first raid. It's entirely surrounded by nasty blood troll marauders, and I can't wait until I get a chance to pry open its front doors and take a look at whatever awful thing is waiting inside. I figured Nazmir couldn't get much cooler than what I had already seen, but then I ventured north of Uldir following some quests and arrived here. This is the Necropolis of Bwonsamdi, the Loa of Death. He's a troll god and this Necropolis is where troll spirits depart for the afterlife. As I stood there gaping at the blood red moon looming over the scene, I noticed ethereal troll spirits drifting toward the Necropolis. Again, I love how much atmosphere Blizzard is packing into Zandalar. I can't really think of any area in Legion that had such an impact on me. Shortly after seeing the Necropolis, I disguised myself as a blood troll and snuck into their camp. Make no mistake: World of Warcraft is still relatively lighthearted and a bit goofy, but Battle for Azeroth also has moments that are surprisingly grim. Part of this specific quest had me running around flagellating trolls as part of their their induction into their warrior caste. It's not a pretty scene. Despite being a relatively small zone, Nazmir manages to pack a surprising amount of variety in its swamps. Some areas will be festering with blood magic and disease, and then I'll round a corner and come out into a scene like the one below. World of Warcraft has always kind of had a problem with transitioning from one area to the next, but Nazmir makes these tonal shifts feel fairly organic. I haven't spent a lot of time in the rest of the Zandalari zones other than a brief tour through Vol'Dun and Zuldazar just to check out their surroundings. Zuldazar's golden temples carved into the sides of its velvety green mountains are just as inviting as Nazmir, but Vol'Dun mostly feels like another desert. I'm hoping there's more than meets the eye, there. But for all the exciting things that Battle for Azeroth brings to World of Warcraft, like Island Expeditions and exciting changes to PvP, I didn't imagine that I'd be so excited by its new zones. With each new expansion, though, Blizzard improves its world design in subtle ways. Zuldazar and Nazmir represent years of quiet innovation coming together to create something that is altogether stunning. I can't wait to see what other sights are lurking in these jungles.